Our new website is a big improvement from our old one, it's fun, colourful & informative! Creative character designs make for a child-friendly and playful atmosphere. The site is responsive across all devices, and features a system which allows parents to book their children onto a course. 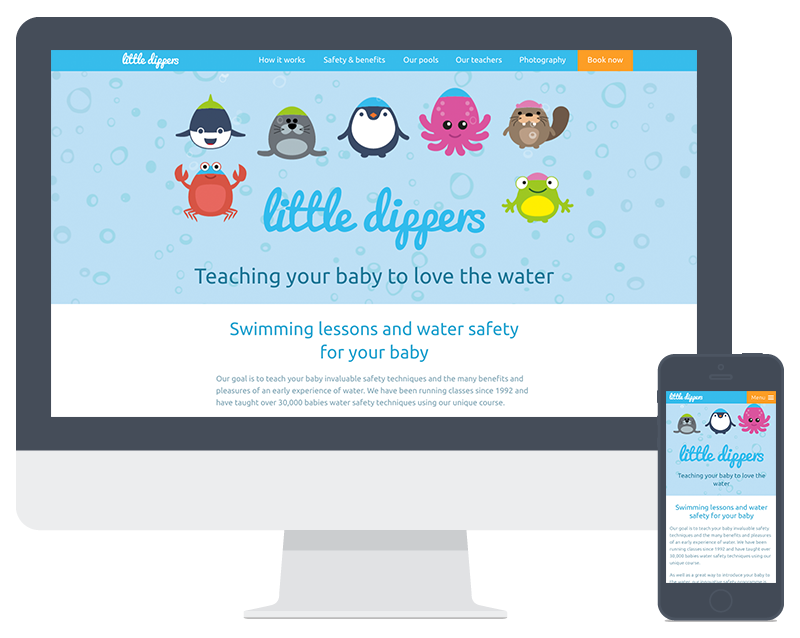 All the information a parent would need on baby swimming is featured, accompanied by lots of high colourful imagery and animations. Little Dippers needed a modern logo along with some character illustrations to reflect what they do. Cute sea animals were chosen to be used on various branding applications and on the website. Little Dippers was founded by baby swim pioneer Lauren Heston and has been running classes since 1992. They've taught over 30,000 babies unique courses in baby swimming. They focus on teaching very young babies water safety techniques in a fun and nurturing environment. Different skills are introduced in each level in accordance with babies natural development, and babies and parents' water confidence. While the focus is on water safety babies also benefit from stronger heart and lungs, increased muscle and cognitive development with improved eating and sleeping patterns.